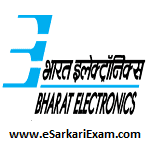 Educational Qualification : Passed First Class BE/B.Tech Degree in Electronics/EC/ET/Telecom / Communication/ ME/EE/CS/CE/CSE/Electrical & Electronics/Civil Branch from any Recognized University. (For SC/ST Applicants Pass Class Required). Eligible Candidates can Submit Application at the Official Website of BEL Latest by 12th December 2018. Applicants First Logon to BEL India Official Website. Open Recruitment Advertisement Link in Careers Section. Click on BEL Contract Engineer for Chennai Unit Advertisement Link.